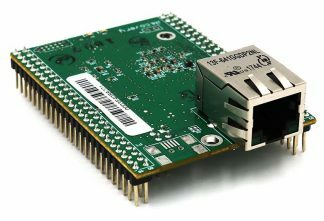 Add Ethernet connectivity to an existing product, or use it as your products core processor. This all-new ARM® Cortex®-powered NetBurner Ethernet System-on-Module is a device containing everything needed to add industrial-quality network control and monitoring to nearly any hardware or device. For a very low price point, this module solves the problem of network-enabling devices with 10/100 Ethernet, including those requiring digital, analog and serial control, and much more. Microchip®/Atmel® ARM® processors are combined with NetBurner’s acclaimed reliability and easy-of-use to get you a solution you can depend on. MODM7AE70 MODM7AE70 ARM Board $79.00 $74.90 $63.90 Order Now! NNDK-MODM7AE70-KIT MODM7AE70 Development Kit $129.00 N/A N/A Order Now! Note: Development kits are intended to be used for software development. If you wish to use a development board for prototyping or for limited production, you must purchase the MODM7AE70 hardware separately.